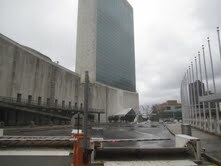 Situated adjacent to the East River, the landmark United Nations skyscraper got its share of Sandy's rising waters, knocking out communications that have only been partially restored. At the same time, a walk through what is called 3B (third basement) showed a remarkable clean-up, with little water remaining on the floor and piles of debris neatly stacked. But the debris included piles of needed supplies. Water also seeped into other floors judging by wet carpets. "Tuesday morning it became evident that we had suffered pretty major damage," Gregory Starr, the U.N. undersecretary-general for safety and security, told a news conference. 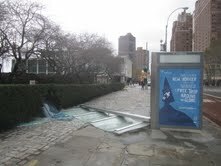 Starr, a former U.S. State Department security official, said water from Sandy's massive storm came over the adjacent highway, the FDR Drive, hit 3B, rose above the loading dock levels and then "started plummeting down to lower levels of the United Nations." This included air chillers below 3B that affected communications. Archives, which include major international treaties, were untouched and many are located in buildings around town. But the print shop, which produces daily documents, was flooded. Yukio Takasu, the undersecretary-general for management, told the same news conference, that a small fire broke out in a circuit breaker in an electrical switchboard area but was put out quickly. Electricity was shut down but by Wednesday the lights were on again. Takasu said the decision to locate sensitive equipment in lower levels was based on weather patterns dating back to the 19th century and obviously would have to be reassessed. The 39-storey building was completed in 1952. "This was a very unprecedented hurricane," Takasu said. But he said the core infrastructure of the U.N. headquarter was intact and no employees were injured. "I think this is good news," he said. The 15-nation Security Council met on Wednesday and the 193-member General Assembly held a meeting on Thursday to hear about the storm's damage but in different locations. Untouched was a temporary $140 million three-storey building on the north lawn of the U.N. complex where U.N. Secretary-General Ban Ki-moon and his top advisers have offices. Ban, a Korean, was on an official visit to Seoul. Major renovation said to be on track Sandy hit as the United Nations was half-way through a $1.9 billion renovation that began in 2009 and is expected to be completed by 2014. Some 3,300 staff members have been moved to various locations around the city and some were scheduled to return shortly. Architect Michael Adlerstein, head of the renovation project, said his work had not been affected by the storm and was expected to be finished by the time world leaders attended the annual General Assembly session in September 2014. A plastic rain cover on the leaking roof over the Assembly's dome shriveled in the rain. Susana Malcorra, the secretary-general's chief of staff, said vital operations, such as contacts with peacekeeping missions worldwide, were able to function and had only a short telephone outage. Meanwhile, the United Nations was organizing supplies for the damage in Haiti and other Caribbean nations, she said. But no one could estimate how quickly all systems would be operational and the cost of the damage. And when transport would allow many staff members from the metropolitan area to return.